Following a successful 2018 that saw over 420,000 course completions, we are excited to present our tentative plan for our new course releases and updates planned for 2019. Every year, VinciWorks plans its course schedule based on a combination of client feedback and prevalent compliance issues. Based on this, we are planning to release training on the SRA Standards and Regulations, DAC6, GDPR, cyber security and more. VinciWorks has also added several US-focussed compliance courses. Note: this is a tentative schedule and is subject to change as we continuously review the compliance training needs of our clients. Organisations have a responsibility and a legal obligation to comply with competition law and ensure staff have proper training on the topic. 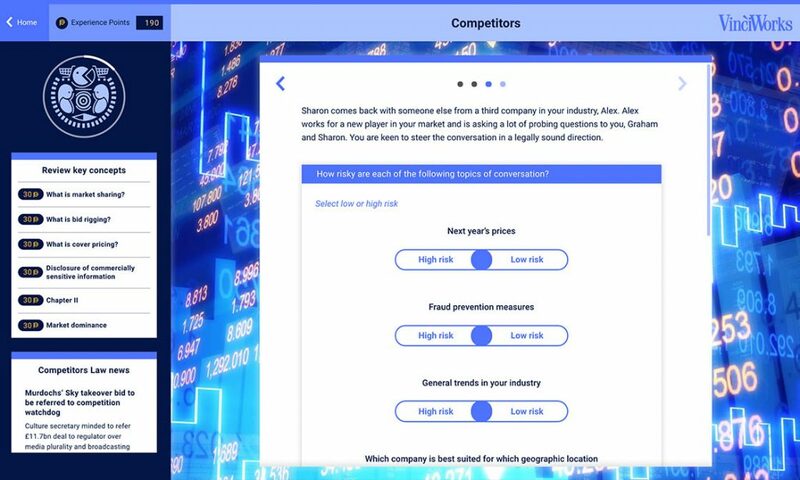 Competition Law: Know Your Market drops users into a set of immersive scenarios that test their knowledge, understanding and ability to comply with the Competition Act 1998 and the Enterprise Act 2002. The Market Abuse Regulation 2016 is a European law that establishes a common regulatory framework on insider dealing, market manipulation and measures to prevent market abuse across the EU. 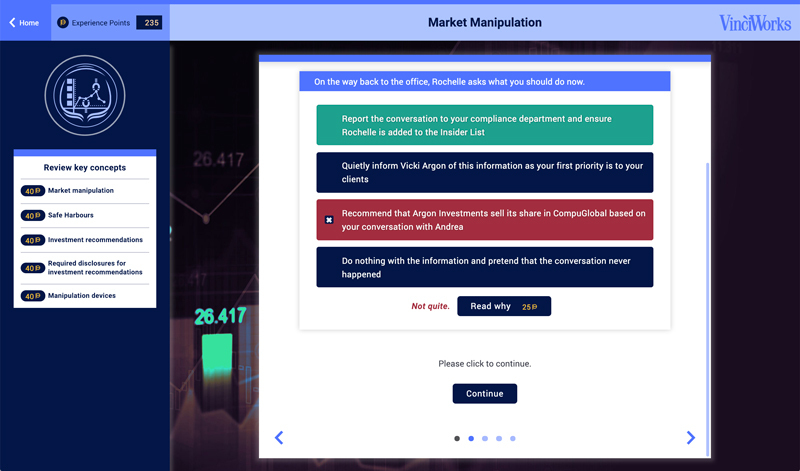 Market Abuse: Know Your Trade drops users into a set of immersive scenarios that test their knowledge, understanding and ability to comply with the latest market abuse regulations. The third in a series of micro courses in which users learn how to identify phishing threats. Through a series of real phishing emails, users are quizzed on the common red flags that appear in scam emails. The micro course uses real-world examples to educate on the importance of cyber security. It can be used as cyber security refresher training, or as a way to identify individuals at high risk for falling into a phishing trap. Following on from the #MeToo-inspired course MyStory: Harassment and Bullying at Work, VinciWorks’ course on diversity brings examples of workplace discrimination to life. MyStory: Diversity and Inclusion presents real examples of discrimination at work through hard-hitting stories. In an effort to quash the phenomenon of box-ticking training, the course has three main sections: Experience, Explore and Share, with the “Seek help” function providing guidance and resources for staff who wish to file a report or receive further assistance. The Solicitors Regulation Authority (SRA) has released new Standards and Regulations to replace the SRA Handbook. Some of the key changes include the SRA principles, new price transparency rules, updates to the accounts rules and more. This interactive course will prepare firms and individuals for the changes to the Handbook with regular quizzes along the way to test users’ understanding and knowledge. The 6th Directive on Administrative Cooperation requires tax intermediaries to report certain cross-border arrangements that contain at least one of the “hallmarks” of tax avoidance. Although the law will come into force from 1 July, 2020, the rules will apply retroactively to all transactions after 25 June 2018. VinciWorks is preparing a comprehensive online DAC6 training course to ensure that all staff are familiar with DAC6 and are aware of any transaction that may require reporting. The training includes a data collection and reporting solution for intermediaries, Omnitrack. Staff should regularly carry out GDPR training to ensure they are continually able to respect and protect individuals’ personal data. The new refresher training will help staff remain aware of GDPR requirements year after year. Within the same course, users can take advanced modules related to their role. This training will include topics such as how to be a DPO, GDPR for marketing and HR and responding to subject access requests. The training will complement our current GDPR training suite. It is the responsibility of the entire business to understand the types of physical risks it might face so your team can be prepared to respond accordingly. Our short business continuity course highlights the risks to the business and outlines a plan of action should an incident occur. The training can be customised to set out the company’s procedures. This new suite of courses will transform health and safety training into more than just a tick-box exercise. The interactive training will take users through health and safety risks relevant to their office with a reporting tool built into the course to track OH&S incidents as they occur. The current cyber security and information security training will be expanded to cover all relevant topics and include specialised training for different high-risk roles. VinciWorks’ flagship AML training will be revamped to include many more options for base and refresher training depending on the risk level of each individual learner. If you have any questions about our course schedule or our training in general, get in touch by completing the short form below. This entry was posted in Course & product updates, Thought leadership on 12th March 2019 by VinciWorks.